Two students from Inver Hills Community College, Michael Casello and Rebecca Larson, have been nominated to the All-USA Academic Team. As nominees, Casello and Larson become members of the All-Minnesota Academic Team. Phi Theta Kappa, two-year college presidents and community college state associations co-sponsor All-State Academic Team recognition programs in 32 states. Nominations are based on outstanding academic performance as well as service to the college and community. Rebecca Larson and Michael Casello will each receive the All-Minnesota Academic Team Scholarship from the Inver Hills Foundation. The annual $500 scholarship will be used by Larson and Casello to help cover their transfer expenses in fall 2014. Larson and Casello will also attend the 2014 All-Minnesota Academic Team Celebration, joining other team members and representatives from the Minnesota State Colleges and Universities system office along with President Tim Wynes, Vice President Christina Royal and PTK advisors from the college. Members of the All-Minnesota Academic Team receive special recognition at the celebration that includes medallions, certificates, and frequently stipends and scholarships. 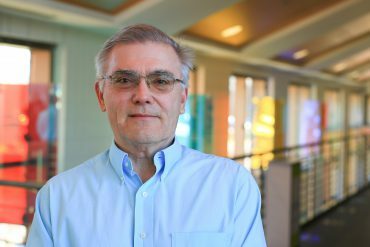 Richard Jewell, an English and humanities instructor who serves as a PTK faculty advisor, reported that the college’s Phi Theta Kappa chapter, which is called Alpha Omicron Beta, ranks as one of the leading chapters in a two-state region of about 50 chapters. During the past 10 years, Alpha Omicron Beta as a chapter has served in the role of regional officer five times. The chapter has also hosted or co-hosted one national PTK conference and five regional conferences. Competing with more than 600 chapters across the nation, the Inver Hills chapter has finished in the Top 100 three times. Jewell added that the chapter’s co-presidents this year are students, Jackson Chell and Debra Koenig. To learn more about Alpha Omicron Beta, please visit the chapter on Facebook. Rebecca Larson, 21, attended Eagan High School and the School of Environmental Studies in Apple Valley, graduating in 2011. Rebecca will graduate from Inver Hills in spring 2014 with her Associate in Arts degree with plans to attend the University of North Dakota to pursue a B.S. in Mechanical Engineering. “I chose mechanical engineering because the field is one of the broadest engineering disciplines and offers many opportunities,” said Rebecca, who also gravitated toward engineering as a career path because very few women are working in the profession. According to the Bureau of Labor Statistics, women account for only 7 percent of the mechanical engineers in the U.S.
Rebecca wants to take her degree overseas and work as a mechanical engineer in Norway, preferably in or around Oslo, the nation’s capital, to be near her Norwegian boyfriend. Along with her sister, Ellie, an Eagan High School student, and her brother, Ben, an airman in the U.S. Air Force, Rebecca is fluent in Norwegian. She studied and taught Norwegian folk dance for nearly a year in Manger, a former municipality near the city of Bergen in the southwestern region of the Scandinavian country. Rebecca compared the climate of Manger to “Seattle on a bad day,” noting that it rained nearly every day for 10 months with only seven or eight days of intermittent sunshine. Rebecca has played the oboe since age nine and while in Norway she performed with Sandviken Undomslag, a wind band with a long list of accomplishments, including a first in a national competition. For as long as she can remember, she has been active in the Sons of Norway, the largest Norwegian/American cultural organization in the world. Many members have watched her grow up and she regards them as extra sets of grandparents. She served as president of her junior lodge and currently helps out as the organization’s webmaster. Rebecca and her sister share a strong interest in the Holocaust. She has visited the United States Holocaust Memorial Museum in Washington, D.C., and also toured the ruins of military bases Nazi Germany established in Norway during the five-year occupation in World War II. She was part of a media team for a Holocaust presentation at the college put together by Vicki Knickerbocker, a sociology and human services instructor as well as a PTK faculty advisor. “People should never forget that the Holocaust took place,” Rebecca said. She joined the Phi Theta Kappa Honor Society Alpha Omicron Beta chapter at Inver Hills after learning about the many benefits linked to participation in PTK activities, including service work, seminars and other opportunities focused on leadership development, scholarships and networking. She highly recommends joining PTK to other students. Vicki Knickerbocker on Rebecca Larson: Rebecca is a very ambitious and hardworking student who likes to take on academic challenges. Her educational interests are quite broad, she likes to play the oboe, travel overseas, conduct scientific experiments, and read books about other cultures and historical events like the Holocaust. She is also a very compassionate and caring individual who has been a math tutor and a grade school mentor. I commend her willingness to go the extra mile to learn all she can and to help others do well. After his second semester at Inver Hills, Michael Casello, 40, a U.S. Army veteran, received a letter congratulating him on maintaining a 4.0 GPA throughout his first year and making the Dean’s List spring semester 2012. The letter also informed Michael that he was eligible to join the Phi Theta Kappa Honor Society chapter at the college. Michael accepted the offer and was officially inducted into the PTK in mid-2012. Within a month, he became the chapter’s treasurer. He stayed active in the chapter for about a year before leaving to become vice president of the college’s Criminal Justice Club. He took on the role of Criminal Justice Club president in May 2013. Michael received a $2,000 Goodrich Veterans Scholarship for both fall semester 2013 and spring semester 2014. During his time in Phi Theta Kappa, he teamed up with other PTK members to create a College Project, which was a unique correspondence/communication board the team moved around campus to present questions to the student body. The project gave students an avenue to express themselves, promoting cognitive thinking while prompting new ideas, suggestions and opinions about various topics. 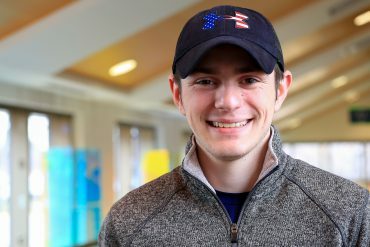 Michael joined a team that competed with other PTK chapters in a program connected to the Hallmarks of Phi Theta Kappa: Scholarship, Leadership, Service and Fellowship. 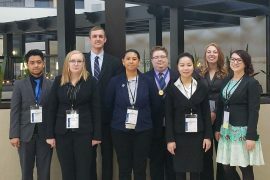 According to the Phi Theta Kappa Honor Society, “Participation encourages excellence, reflects fairness, recognizes quality, and leads to enhanced student, advisor, and chapter development.” Michael also attended regional conferences where he took part in seminars that helped students develop stronger and more diverse leadership skills. 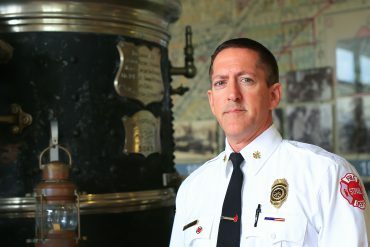 He credits those experiences with giving him the opportunity to become a better leader in PTK and the Beta Sigma Omega Lambda chapter of the American Criminal Justice Association. Michael reported that his Phi Theta Kappa advisors, Richard Jewell, Vicki Knickerbocker, Melanie Dalbec and Nicki Bottko, the latter the college’s student life activities coordinator, have been a huge help to everyone involved in the Inver Hills PTK chapter. “I cannot say enough good things about the people I am surrounded by in Phi Theta Kappa,” he said. Michael plans to get fully engaged with PTK during spring semester 2014, his last semester at Inver Hills, before transferring to either Metropolitan State University to join a B.A. Criminal Justice cohort program or the University of Minnesota to pursue a B.S. in Sociology of Law, Criminology, and Deviance. He is looking forward to walking during the May 2014 graduation ceremony with his son, Kyle, who is earning his A.A. at Inver and will go on to the U of M to pursue a B.A. in Communications and Cultural Arts. Richard Jewell on Michael Casello: After many years in a variety of jobs, Michael was able to start college. As an older returning nontraditional student, he has excelled at both academic and service accomplishments. He is in the IHCC Criminal Justice program and plans a career in that field that likely will be very fruitful and helpful to those who come in contact with him in the future. In Phi Theta Kappa, he served as our treasurer, completing a great job of bringing together our financial books and records and was a clear exemplar of the Phi Theta Kappa goal to show excellence in scholarship, service, fellowship and leadership. He was well-liked, positive and hardworking throughout his time as a PTK officer. Nicki Bottko on Michael Casello: Michael is dedicated to being a quality community member. On campus this means that he throws his whole self into any project that he takes on. He was an amazing treasurer of PTK, he lead the Criminal Justice Club from being essentially nonexistent to one of the largest clubs on campus. He is always ready and willing to help out any student leader when they need it. Off campus he volunteers with community policing organizations and still makes time for his family. Michael is one of those students who inspires me. I’m not sure I have ever seen him complain once and it is such a blessing to have him around! Visit the Alpha Omicron Beta chapter on Facebook.